My aunt Mable (not Mabel!) was born in 1913 in an Oregon logging camp. She married my dad’s older brother Gaylord, and they lived in various places in western Oregon over the years: the now-vanished town of Signal, North Albany, Goshen, Albany, Springfield. Mable was the last survivor of my dad’s generation, living long enough not only to vote for FDR in 1936, but also to vote for Hilary in 2016 (good for her!). She died last year at age 104. Now that I live in Albany, I keep a lookout for historic Albany community cookbooks. 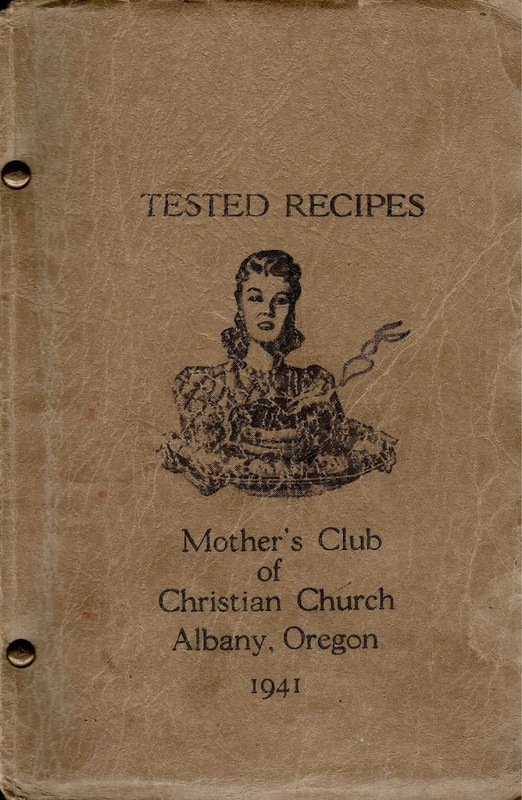 I recently bought one, sight unseen, from a book dealer in Sisters, Oregon: Tested Recipes, compiled in 1941 by the Mother’s Club of Christian Church, Albany, Oregon. Among the contributors was Mable Engeman, who at the time would have been a 28-year-oldish housewife with two children. Six of her recipes appear in the book. Mable was a noted family cook when I was a child, and her daughter Shirley knows her way with food as well. The six recipes in the cookbook are memorable because my Aunt Mable once vouched for them. And one of them is a longtime favorite in my family. It’s a very simple dish, one that my mother (and after her death, my father) always made at Thanksgiving—and so did her sisters Gwen and Dorothy, my cousin Nancy, my sister Laural, and myself. The connection is that my dad, Carlet, roomed with Mable and Gaylord just before World War II and his marriage. Of course, this recipe can be found in countless cookbooks. And that’s because it’s mighty simple and it’s simply very good with breast of turkey. As Mable well knew. Pick over and wash cranberries. Wash oranges, quarter and remove seeds. Put cranberries and oranges through food chopper using coarse knife. Add sugar and mix well. Chill 2 or 3 hours before serving. Makes 1 quart.